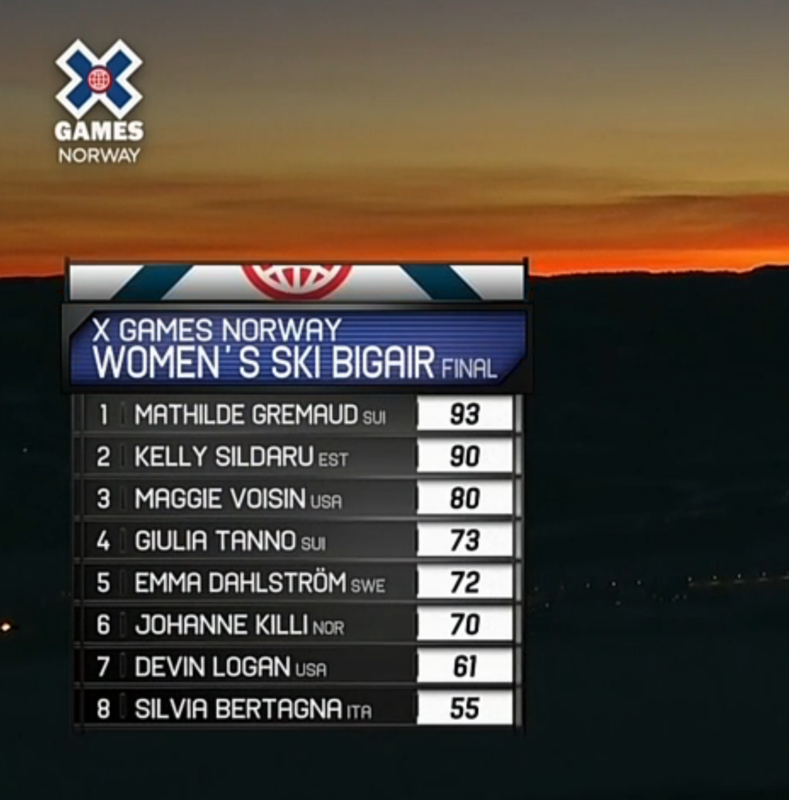 X Games Norway finished off strong today with WMN’s & MEN’s ski big air finals. The girls kicked things off and they definitely put on a hell of a show. Newcomer Mathilde Gremaud came out the gate swinging unleashing a beautiful rodeo 9 safety. Kelly Sildaru put down a perfect switch 10, getting pushed into the jump due to the difficult speed situation. Giulia Tanno also put down a nice switch 10 blunt and Emma Dahlström stomped some very nice cork 7 japans and switch 7 mute’s. Maggie Voisin skied clean all night stomping a nice rodeo 9 and a switch 7. Kelly took over the lead on her 3rd run with a sick switch 12 mute. After stomping some clean tricks Mathilde was sitting in 2nd place giving her only one last run to bring home the gold. Going all in, Mathilde stomped a huge switch double cork 10, perfectly executed and a first for her. With a perfect 50 she took over the lead, no question’s asked. Now it was Kelly’s turn to land something big on her final run. She opted for a switch 1440 but was unfortunately not able to get the grad but landed the first ever 1440 in Woman’s competition none the less, putting her in the history books once again. It definitely was a night to remember for Woman’s skiing. Huge congratulations for all the girls throwing down big time. 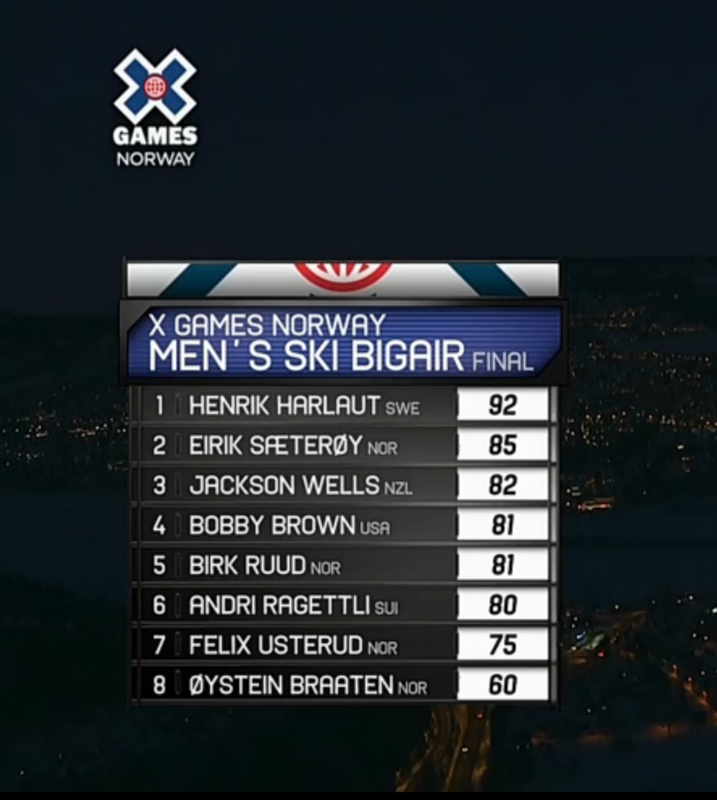 After the girls it was the boys turn to finish things up at X Games Norway. With a final, which most definitely did not disappoint the X Games came to an successful end. Bobby Brown officially kicked things of coming in hot with a huge triple 1440 mute getting him a massive score of 44. Henrik Harlaut unleashed a massive double bio 1260 safety, which he followed up later with another double bio 1260 double japan. Oystein Braaten put down a massive switch double cork 1440 leading tail, but was unfortunately not able to put down his triple cork 1440 in the end. Unfortunately the same thing happened to Felix Usterud, who was also not able to put down his triple wooble 1620 mute to japan. Andri Ragettli came out the gate swinging unlerashing a massive left triple 1440 mute grab followed by a triple 1620 mute grab Unfortunately Andri struggled to put down his triple cork 1260 ending him in 6th place. X Games newcomer Birk Ruud laid down a massive triple cork 1440 and 1620 giving him 5th place overall. Even though Bobby Brown laid down the highest single scored trick right after the start he was unable to put up another solid score, struggling with his switch double misty 1260 once again. Landing a super smooth switch double cork 1440 mute put him in 4th place though. Coming in hot after qualifications Jackson Welles wanted to make sure he’s here to stay. Stomping a massive triple cork 1260 and and humongous switch triple wobble 1440 he was able to overtake Bobby Brown on his last attempt and secure himself a spot on the podium. Up next was the winner of the qualification and absolute newcomer Eirik Saeteroy. Eirik put up an absolute clinic, stomping massive triple cork 1440ß, 1620, a triple cork 1260 and his absolute mind blowing switch pre-nose grab double cork 12, which he held throughout the whole trick and giving him a score of 47. Eirik was able to grab 2nd place overall and cemented his way in the big air circuit for the years to come. Hopefully we see a lot more from this young Norwegian shredder. In the end it was Henrik Harlaut who topped the podium once again. With a crazy double bio 1260 double japan and a massive nosebutter triple cork 1620, Henrik proved once again that he is the absolute king of big air. It was definitely a final to be remembered. Big up to everyone who competed throughout the week and put on a great show.